Hamilton is making news all across the country. But we’re not talking about the musical. We’re talking about the malt, and Hamilton’s Tucson headquarters was the destination for this week’s show dedicated to the Sonoran soul of the single malt – live from the barrel room at Hamilton Distillers! 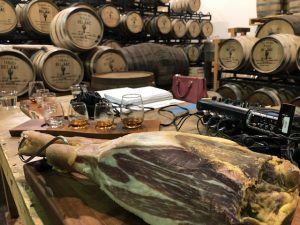 Our celebrity co-host was local butcher Ben Forbes of Forbes Meat Co. who talked about his own passion for whiskey and the role it plays in the butchering arts. He even brought along the hind leg of a pig to demonstrate the perfection of prosciutto and single malt pairings. We then welcomed Casino Del Sol’s executive pastry chef Gina Skelton who had some sweet news to share about her life-size gingerbread house. Prosciutto and single malt whiskey. Pairing perfection! 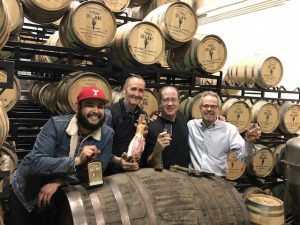 Then it was time for local malt master and Hamilton’s assistant distiller Ramon Olivas to join the party, with some fresh news about his annual Winter Release, the company’s growth plans, his barrel program, and the core expressions of Whiskey Del Bac in his portfolio – Classic, Dorado, and Clear. Slainte!